Now that we have understood the basics of ActiveMQ network connector in part 1 and part 2 of this blog series, in this part 3, we will examine how ActiveMQ load balances consumers which connect to a network of brokers. Concurrent consumers are used when messages in a queue can be processed out of order and usually to improve message throughput. ActiveMQ broker dispatches messages in a round-robin fashion among the consumers in order to load balance message consumption across concurrent consumers unless the consumer is specified as exclusive. Let's see the following example where three consumers are concurrently processing messages from queue foo.bar. A producer enqueues 60 messages which are processed by three consumers (20 each) in a round robin fashion. The following screenshot shows 3 consumers processing messages from queue foo.bar. 60 messages were enqueued and dequeued. As shown below 20 messages were processed by each of the consumers. Now that we have seen how concurrent consumers work on a single broker, we will now examine how they work when consumers are spread across network of brokers. Let's explore how ActiveMQ handles local and remote consumers with the help of a configuration shown in the figure below. Let's look at the consumers to see how the messages have been divvied out. As you may notice, ActiveMQ broker dispatches the messages equally to local consumer over the remote consumer giving them the same priority. 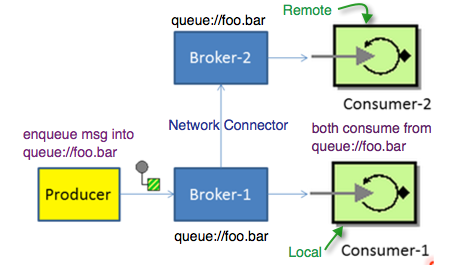 The remote consumer, Consumer-2 is only broker 1 hop away which is less than configured networkTTL value of 2. This leads to suboptimal routes especially when brokers are connected such that multiple routes are possible between producers and consumers. It is preferable to dispatch to local consumers over remote consumers in order to ensure shortest path between producers and consumers. ActiveMQ provides a way to configure the priority between local consumer and remote consumer using the property decreaseNetworkConsumerPriority on the network connector. By default, this value is false and hence the local and remote brokers were treated alike. If we repeat the above steps after changing the decreaseNetworkConsumerPriority="true"
then we find that local consumer, Consumer-1 is given preference over remote consumer, Consumer-2 which is 1 broker hop away. ActiveMQ intelligently figures out shortest path in a network of brokers between message producers and consumers. Please read the following link to gain further understanding of optimal routing by ActiveMQ. This concludes part 3 of this series where we saw how to differentiate local and remote consumers to assist ActiveMQ determine most optimal path between message producers and consumers. Very interesting article. I'll surely use this in the future. The fusesource url does not work any more for me. It redirects to http://www.jboss.org/overview/.